Performer Andrew Johns will be headlining the Halloween Howl at the Conexus MCC Centre this Saturday. The event is a fundraiser for the Pipestone Hills Golf Club’s new clubhouse. Mike Schwean is excited about the upcoming Halloween Howl this weekend at the Conexus MCC Centre. The event is coming up this Saturday night, with world-class entertainer Andrew Johns. Johns was touring in England last week, and is heading to Canada this week to perform in Moosomin. “I don’t think people realize just what a great entertainer he is,” Schwean said last week. “He does a lot of old-time stuff, Billy Joel, Elton John, 80s and 90s bands. “I know he’s off in London right now, and he will be getting home and coming here. The event is a fundraiser for the Pipestone Hills Golf Club’s new clubhouse. “Fundraising has been going fairly well for the clubhouse,” Schwean said. “Most of the events they have done have gone over really well. Corporate tables are being sold and individuals can purchase tickets. See the ad on page 20 for details on ticket sales. Andrew loves to make people happy! Loves to make people smile, is a master at invoking emotion through his impeccable skill in every song his audiences love and request. Ask his clients: “Who in the world of entertainment compares to Andrew Johns?” And they will tell you “No-one!” There’s no-one like Andrew Johns for variety, spontaneity, great sound and performance and reliability. Clever, polished and unbelievable impersonations are his trademark. Yes, a one man show making technology work for him—sheer talent on stage as he pulls off four-part harmonies from Queen, Eagles, Steely Dan and Stevie Wonder. No wimpy falsetto’s here—he generates the full powerhouse female vocals of divas like Pink, Adele, Norah and more. 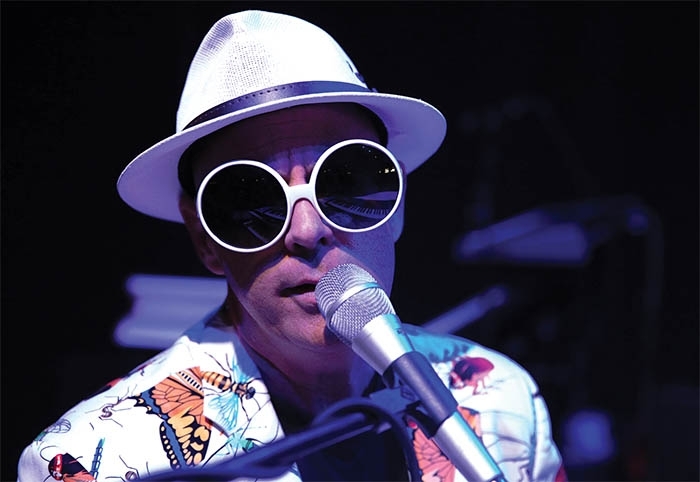 His Elton John impersonation is one of the best in the world and the demand for his show is increasing. His commitment to costume, minute detail and nuance leaves you breathless. This is showmanship at it’s finest. His custom tailored shows ensure the audience will experience a performance to be remembered forever. He past clients trust him explicitly to deliver over and above all expectations. And he does. With over 40 years in the business, he has a reputation of excellence, both on stage and off stage.